Why could the 10th BRICS summit be the key to a larger agenda? When the idea of the BRIC (Brazil, Russia, India, and China) was first coined by Jim O’ Neill of Goldman Sachs in 2001, few took the group very seriously. But it is this group that has come up with a sterling performance in the last 15 years. China is already the second-largest economy in the world and India has crossed France to become the sixth-largest in terms of real GDP. Both Russia and Brazil have taken a hit with the downside in the commodity cycle but they are still potential powerhouses. Between India and China, they account for 40% of the world’s population and potentially the world’s largest combined market for all kinds of consumer goods. Moreover, China already accounts for 50% of the demand for all metals and minerals in the world. Thus, the critics were, more or less, silenced. However, there are still two areas where India has some catching up to do with the other BRICS nations. Firstly, India still has a large catch up to do on the GDP per capita front. For example, Russia has a GDP per capita of $12,000, while Brazil and China are above $10,000, and South Africa is close to a per capita of $7,000. India, on the other hand, has the lowest GDP per capita of $2,100. Secondly China, Russia, and Brazil run a comfortable trade surplus, while South Africa has trade parity. India, meanwhile, is likely to end up with a trade deficit of nearly $200bn for the fiscal year 2018-19. The chart below captures how India needs to build on the trade game. How BRICS ranks in the overall world order? There are five key data points that need to be understood to put BRICS in context of the world economy as a whole. The five BRICS nations comprise 40% of the world’s population and nearly 25% of the world land area. 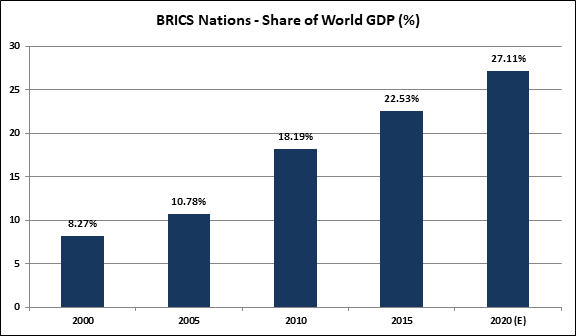 The contribution of the BRICS nations to world GDP has grown from about 8.3% in 2000 to 23% in 2017. India and China used globalization to make their economies part of the global supply chain. India became a global hub for services, while China became a global hub for manufacturing. On the other hand, Brazil, Russia, and South Africa used the fruits of globalization to market more of their abundant natural resources. Both India and China saw a vast expansion in their middle class and that became a tipping point for the creation of two of the world’s biggest markets. For example, in the year 1990, China accounted for less than 3% of world production but by 2014 it was accounting for 25% of world output. In 1990, China accounted for less than 1% of the world’s middle class but by 2015 China was accounting for 15% of this population class. During the same period, Indian middle class went from 1% of world population to 8% of the world population. But India also built a services hub on the back of a $150bn IT services sector as services came to account for over 60% of the Indian economy. However, it is Brazil, Russia, and South Africa that have really lifted people out of poverty. In the decade post 2003, Brazil lifted nearly 29mn people above poverty, while Russia reduced the number of people below the poverty line from 29% to just 11%. On this front, the commodity BRICS nations have done better. While China and India are the absolute beneficiaries, there are some factors that still make them vulnerable. Recent reports have stated that China and India may be losing their edge in manufacturing and services, respectively, due to rising wage costs. Also, the World Bank estimates that automation threatens 68% of the jobs in India and 77% of the jobs in China. BRICS economies have surely come a long way. The agenda for 2018 could largely predicate on five key factors. The BRICS summit is being held in the backdrop of the US trade tariff war which is likely to hit all five nations of the group. The focus will be on consolidating intra-BRICS trade through reduced tariffs. The world is seeing Africa as the next big growth centre with South Africa and Nigeria taking the lead. China is already the largest buyer of minerals and inputs from the African region. PM Modi will be covering key African nations before reaching Johannesburg. China’s Belt and Road Initiative (BRI) will bring Africa closer to Asia and the importance of wooing Africa is not lost on Zuma or other BRICS leaders. Both Russia and China may not be enjoying the best of relations with the US and the rest of Europe. Both Xi Jinping and Vladimir Putin will be looking to consolidate their leadership with closer cooperation within the BRICS community. For India, the agenda will be two-fold. Firstly, it needs to use its influence to cultivate the Russia-China axis as a counterweight to the US, which is becoming increasingly inward looking. Secondly, India will have to use its market as a carrot for getting higher level of investments from most of these countries. Finally, the BRICS summit completes a full 10 years since its first meeting in 2009 in Russia. It is the BRICS’ nations that have weathered the global financial crisis and the oil shock much better than the US and the EU. How it can emerge as a credible bloc that can stand up to the US, EU, the G7, and the OPEC is what remains to be seen and deliberated upon!